Street art is part of Parisian culture. It is found on the walls and facades of the city while walking. Bars even adopt the style of street art in their decoration and galleries make it their business! 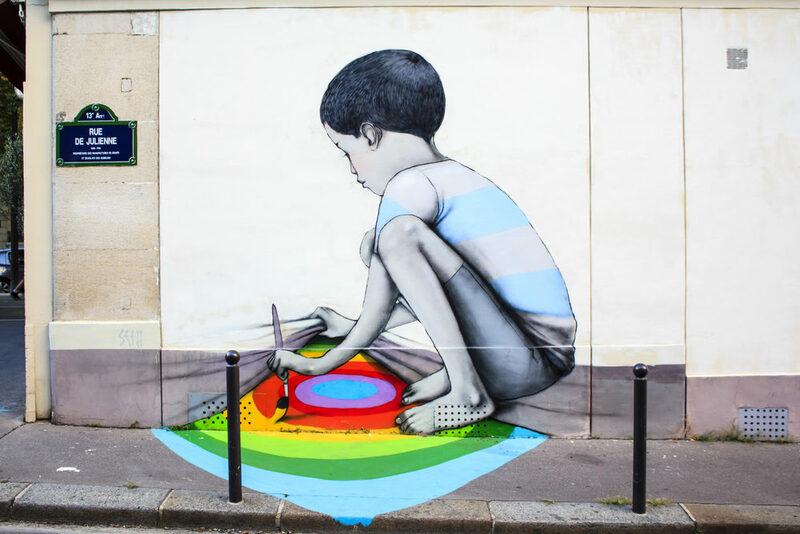 What to see in Paris and what neighborhoods with street art paintings are not to be missed? The district of Ménilmontant and Belleville in the 20th neighborhood of Paris is full of street art in the streets of Ménilmontant, the street des Petits Carreaux, the street of the Ermitage and also in the street Henri Noguères. They appear on the façades where the name of a street usually appears. From graffiti to more elaborate design there is something for everyone. Good to know: The average height is 4 meters. Above this size, it is the building owners who must remove them, below the same size, the city is responsible for removing them. It is the street with the most street art designs in the city. All its walls are covered from top to bottom by graffitis! Very impressive ! Unfortunately an ongoing real estate project threatens the survival of this street and its neighborhood bars of the 20th arrondissement. Works by artists such as Miss Tic and Jef Aerosol as well as unknown artists cover the façades of this district at the corner of the street of the Cinq Diamants, the street of Moulin des Prés for example in this insurgent historic district. Currently, it is the turn of the international artist Bansky to make his arrival in Paris ! For more information on neighborhoods to visit, contact the personal of our hostel.